A Triathlon coach from Cainta, Rizal and a thirteen-year old native from Batangas emerged as the fastest swimmers during the recent Verde Island Passage Open Swim Challenge at Punta Malabrigo, Lobo, Batangas. Ronald Molit won under 5-km category. Alyssa Fajermo won under 2.5-km category. 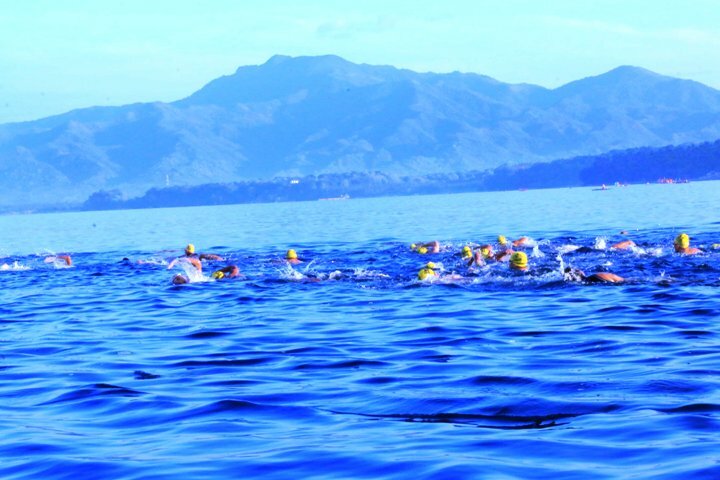 One hundred twenty-seven swimmers witnessed the beauty of Verde Island Passage during the Open Swim Challenge. Thirty-four-year old coach Ronald Molit won the overall 5-kilometer category while young Batangueña Alyssa Fajermo finished first under the 2.5-kilometer category. They were two of one hundred and twenty-seven professional swimmers and athletes who competed at the first ever Open Water Challenge in Lobo, Batangas. Both shared their experiences while traversing the Verde Island Passage – dubbed as the “center of the center of the world’s marine biodiversity”. “Habang lumalangoy po ako, nakikita ko po ang mga magagandang corals at may mga isda din po. Kaya kahit napapagod po ako, na-enjoy ko pa rin po. [I saw the beautiful corals and school of fish underwater. So though it was tiring, I enjoyed swimming. ]”, Fajermo shared. Molit, who consistently led the race, encountered an interesting creature. “Mayroong jelly fish, bigla na lang dumapo sa mukha ko, sobrang kati pero nawala din naman. [There was jelly fish that hit my face. It was really itchy but it was gone in seconds. ]”, he expressed. Molit also shared that he felt safe and focused all throughout the race. “There were marshals, boat guards and divers. They ensured our safety so I did not worry,” he added. Bantay Kalikasan, the environmental arm of the ABS-CBN Lingkod Kapamilya Foundation, Inc., took on developing Lobo as another ecotourism site in 2015, shortly after the threat to mine and putting a coal plant in this area was announced. As a better alternative, Bantay Kalikasan’s game plan is to focus on ecotourism and agriculture, through setting-up organic farms and empowering people’s organizations – an effort to create livelihood at the same time sustaining the environment. Representatives of the community Marita Mendoza and Noni Armamento pose with Dyan Castillejo and their bounty harvest from the Mabilog Sawang organic farm. Local produce by the community was sold during the event. Through our team’s intervention, we will boost ecotourism so we are going to work on developing the mangrove area, create floating restaurant and cottages, and all of these enterprises will be owned by the people’s organizations,” Bantay Kalikasan Program Director Jen Santos articulated. First Gen Corporation has been Bantay Kalikasan’s staunch partner in creating model communities in Lobo and in other areas in Luzon. “The ABS-CBN Lingkod Kapamilya Foundation, Inc. and First Gen Corporation share the same passion of protecting the environment. We believe in sustainability. We can do this Open Swim again and again, as long as we protect the environment,” First Gen Vice President for External Affairs Mon Araneta enthused. Bantay Kalikasan works with the Science, Education and Advocacy (SEA) Institute to ensure the preservation and protection of the Verde Island Passage through different campaigns and events like the Open Swim Challenge. The Verde Island Passage Open Swim Challenge was organized by Chips Guevarra and Betsy Medalla, award-winning professional swimmer. This event is a testimony that Bantay Kalikasan, its partners and most especially, the community, will not allow mining and coal plant in this area. A plan for a bigger race, a triathlon, is eyed next year. View this link for more Verde Island Passage Open Swim Challenge pictures: https://www.facebook.com/abscbnfoundationkapamilya/photos/?tab=album&album_id=1092379727485153.